¡Bienvenido! Are you having trouble finding a Spanish translation dictionary to translate your Spanish documents? Look no further, Systran has the largest and most complete dictionaries available with millions of words, phrases that you won’t be able to find elsewhere. With Systran’s Spanish translation dictionary you can get translations for single words, expressions, phrases and full documents in just a few seconds. Firstly, because it’s the most complete dictionary you can find out there. You can use it for everyday use, from chat conversations and emails, to entire translation of official documents. Get quick access to commonly used Spanish words and expressions using our general dictionary. Translate Spanish terms from a variety of subjects and fields such as computer, military, agriculture, science, and many more, that are so difficult to find when using online dictionaries. Find and choose the alternate meanings that best fit the context, making it invaluable to any professional translator. It even shows you what field a word belongs to, whether it’s computers, electronics, math, etc. Find out which part of speech is presented with that Spanish word. 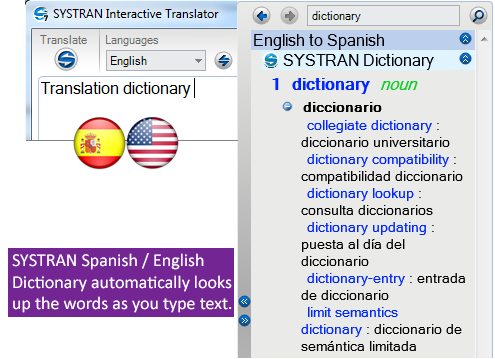 Systran’s Spanish translation dictionary can be used by anyone from students, company employees, to professional translators. For home and office, it includes all the words you need to translate Spanish text. For professional translators, you can do so much more with it, from finding the equivalent of difficult or technical terms and phrases, choosing alternate meanings that fit your translation and building additional dictionaries to save time. What more can you ask for in a Spanish translation dictionary? See our packages and get yours now. You won’t find a more complete dictionary anywhere else.